Dommy Hamid was born in Jakarta, Indonesia, but spent his childhood years in Pekalongan, Central Java and Bandung, West Java. Dommy spent 14 years in the United States. He went to high school in Plattsburgh, NY, then went onto college at The University of Texas, Austin receiving his BS EE and BA in Japanese. He worked for a few years in Hayward, CA as a web and database manager, before returning to Indonesia in 2003. 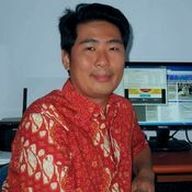 He worked with a few non-profit organizations in Jakarta as IT consultant before joining GNI in 2010 as webmaster and programmer, managing and designing websites for GNI. His personal interest includes comics, cartoons, gaming, and technology. 1.) I’m grateful for the new president of Indonesia. He seems to be very different from typical Indonesian politicians. If he can endure the upcoming 5 years of being attacked by his opponents, then Indonesia will have a much brighter future. 2.) I’m thankful for a job that is flexible enough for me to work from home, and useful enough to serve others in the in the nation of Indonesia and around the world.